Unlike systems that incorporate a fixed pivot-point, dual pivot-point, or linear element, the Quickie IRIS rotational design is based on the idea of rotating the seat-frame around a user's center-of-gravity. This combined with up to 60° of posterior rotation and hi-resolution adjustment, provides the ultimate in control, maneuverability, and stability. Instead of tilting the seat frame from an outside pivot-point the Quickie® IRIS™ actually rotates the seat frame around the users center-of-gravity. This rotational system provides the shortest possible wheelbase without compromising stability. It also insures a smooth and controlled rotation. The Quickie IRIS features three tilt ranges: -5° to 50°, 0° to 55°, and 5° to 60° on the standard 55° seat frame, and -5° to 35°, 0° to 40°, and 5° to 45° on the 40° seat frame. As the seat frame rotates past 45°, a significant amount of pressure transfers from the seat to the back. By providing up to 60° of tilt, the IRIS insures that the majority of pressure is removed from the ischial tuberosities. For individuals who only need positioning relief, the 40° tilt frame is ideal. The Quickie Iris now features a 12 1/2" front seat-to-floor height. Using a drop seat, this distance can be lowered to an even lower 10 ½" seat-to-floor height. Low seat-to-floor height is critical for users who use foot propulsion. Eliminate the need for exposed cables with the Foot Release Tilt Actuator. Never again worry about cable systems getting in the way. It's easy to operate, clean as a whistle and tangle free. This super durable hub lock is now 10 times stronger. Rated at 158kg (350 lbs), wheels lock securely into place eliminating the dependence on the rear wheel's tire pressure for a secure, locked position. Minimal adjustments are needed and cables are conveniently kept out of the way making engagement of the hub lock a snap. The locking mechanism provides multiple mounting positions for quick and easy access. Swing-in/Swing-Out Footrests are excellent for confined spaces and are ideal for reduced hand dexterity. The Quickie IRIS features a special angle-adjustable stroller handle that quickly adjusts to a variety of caregiver heights, conveniently offered at no charge. A patented backpost bracket allows repositioning of the backpost seat-depth without removing the attaching hardware. 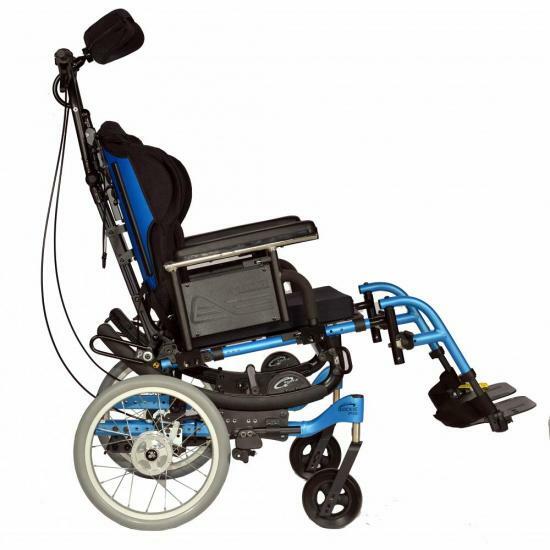 Specialty options, such as a reclining backrest, vent-and-battery tray, and one-arm drive are all available as "on-chair" options. A tilt-angle indicator and a set of tilt-stops ship with every chair to provide a precise tilt range and tilt angle-setting. Overall Width: 22" - 33"
Caster Options 4" X 1.25", 5" X 1", 5" X 1.5", 6", 6" X 1.5", 8", 8" X 1.5", 8" X 2"